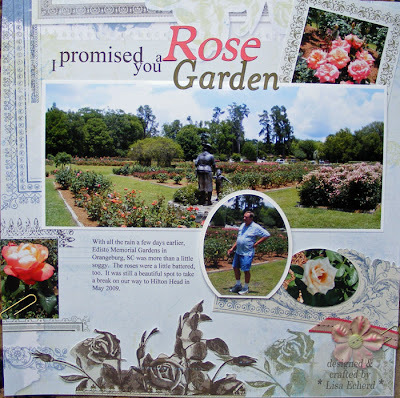 I promised Lenny we would stop at the rose garden on the way to Hilton Head this past summer. Unfortunately, they and we had so much rain in May that the ground was sodden and the roses tinged in brown when they normally would have been at their peak. Still, getting a break on the six hour drive is welcome. I love to travel but I'm not much of a road warrier anymore. About 2 or 3 hours is as far as I want to go without a meaningful break. Walking through the rose garden, having our lunch under the trees and taking a quick walk by the waterway was wonderful. 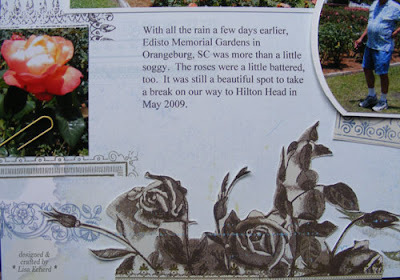 This is the last of the Hilton Head pages for 2009. 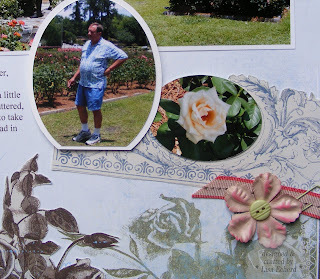 For this layout, I trimmed up some pieces of two Basic Grey Periphery collection sheets to add to the distressed collage effect of the paper. The title is a combo of printing directly on the background paper, Cricut cut letters, and Basic Grey stickers. Lisa this is such a beautiful page! The design/collage.. absolutley wonderful.